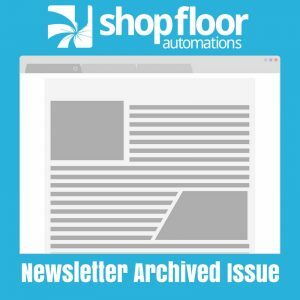 The following is an archived copy of the Shop Floor Automations Newsletter – May/June 2014 issue. Are you dealing with minor issues that aren’t big enough to justify bringing in an outside tech, but are constantly frustrating your staff? Do you need some additional training on a Predator product to make your staff more productive? Are there machines that do not work and you have gone back to a manual system like floppy disks or USB sticks? Don’t waste your time and effort, let SFA help you since we are the experts. Call us and let us remote into your system to fix it or to schedule a “quick fix” service call when we are in your area. New wireless and serial hardware are available including support for network based CNC machines. Contact Sales for more information. Check out the SME Education Foundation for more information on how our partners and industry gives back each year. Over $8 million in scholarships have been awarded to students looking to get into our market. SFA is looking for new talent as well from technicians, a customer service specialist and sales executives. If you know someone in the San Diego, CA area, please contact us. With Fanuc I Series controllers, you can monitor your CNC machines with ease. Let us demonstrate how to collect real-time data such as feeds, speeds, part program, overrides, alarms, cycle time and part counts. Report and chart any data with SQL, Oracle or Access. MT Connect is also available for Mazak, Okuma, Mori Seiki, Siemens, and others to capture similar machine data with our solutions. RS232 Serial Cables are a thing of the past and while most shops link the CNC machines this way, you now can upgrade to go wireless. Eliminate cables, increase baud rates up to 50%. If you have cabling issues, bad connections, power surges, long cable runs or just want to save time and money, we have the solution for you. Our wireless units come with a lifetime warranty, all cables and connections and work with 802.11 B/G networks with the latest security encryption. Works with any brand of CNC controller regardless of age or connection type.